The State Herbarium of South Australia‘s Plant of the Month for April 2017 is Leptospermum lanigerum, a species that also occus in DEWNR’s Park of the Month, Deep Creek Conservation Park. Leptospermum lanigerum near the SA-Vic. border. Photo: C.C. Clarke, ALA.
Leptospermum lanigerum (Aiton) Sm. 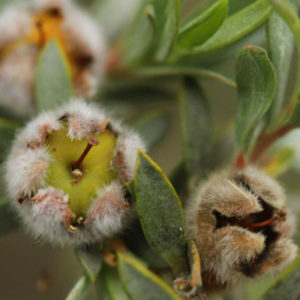 has the common names of “silky” or “woolly tea-tree”. It is found in Deep Creek Conservation Park along its permanent creeks, around its waterfalls and in its swamps. There it is often associated with other wetland species such as Eucalyptus ovata, Leucopogon lanceolatus, Correa eburnea, Goodenia ovata and Blechnum ferns. 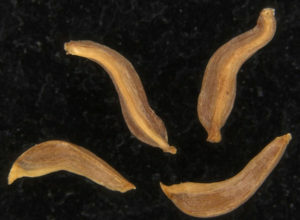 L. lanigerum, seeds. Photo: SA Seedbank. The plant’s scientific name is derived the Greek words “leptos” and “sperma” meaning “slender seed”, which directly relates to the seeds of the type species L. scoparium, but also applies to L. lanigerum; “lanigerum” is from Latin for wool–bearing, describing the hairy fruit, buds and leaves of the species. The genus is commonly called “tea-trees”, a name which originated from the crews of Captain Cooks voyages who brewed tea from the leaves in an attempt to prevent scurvy. L. lanigerum, flower, Photo: R.Wiltshire, Wikimedia (CC-BY-SA). The silky tea-tree occurs from the Mt Lofty ranges east to Victoria, New South Wales and Tasmania. The Type was from material cultivated in Kew Gardens from Cook’s second voyage in 1773 after seed was collected by Captain Furneaux of the HMS Adventure in Tasmania, so becoming the first Leptospermum brought into cultivation. In South Australia, it grows into a small tree but can become quite large in springs on Western Kangaroo Island. Its white flowers are prominent in late spring and attract many insect pollinators such as jewel beetles. The seeds are held in woody capsules and are released after fire or other disturbances, but the species also possess lignotubers and epicormic buds and can grow back quickly after fire. As its common name describes, the silky tea-tree’s hairy leaves gives the plant an attractive grey-silver sheen, it commonly grows with the greener foliaged “prickly tea-tree” Leptospermum continentale, and hybrids with intermediate characters are fairly common. A green variant of L. lanigerum also occurs in the South-east of South Australia and Western Victoria and was considered by Joy Thompson in a revision of the genus (Telopea 3(3): 301-449, 1986, 17.7mb PDF) to be a possible relict influence of L. nitidum that now occurs in Tasmania. L. lanigerum, fruit. Photo: Lyn Allison, ALA. The recent high prices for New Zealand’s Manuka honey from L. scoparium has created much ongoing interest and research into Australian Leptospermum species. Many Australian species have been found to have significant levels of DHA (dihydroxyacetone), with one website report noting that L. lanigerum “ticks many boxes”. Selection of high yielding populations and breeding programmes are continuing (see ABC report). 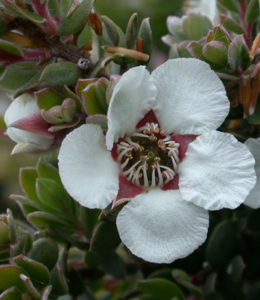 Note that the related species Leptospermum laevigatum (coastal tea-tree) from Victoria, Tasmania and New South Wales, is a highly invasive weed in most Australian states and now declared in South Australia (580kb PDF fact sheet from Biosecurity SA). This entry was posted in The Plant Press on 31 March, 2017 by Jürgen.